Pope Saint Celestine I was pope from 422 to April 6, 432. Elected unanimously to the papacy, he moved forcefully against Pelagianism, Novatianism, and other heterodox movements, using his influence to suppress these groups and banish their leaders from Rome. He also effectively asserted the primacy of the Roman church in various rulings and letters which have been preserved. Later, Celestine set the course the Catholic Church would take during the Nestorian controversy by commissioning Cyril of Alexandria to investigate the teachings of Nestorius, who had recently been elected patriarch of Constantinople. Though he did not attend personally, he sent delegates to the Council of Ephesus in which the Nestorians were condemned, in 431. He also sent Palladius to Ireland as its bishop to combat Pelagianism and is thought by some to have had a role in the sending of Patricius (Saint Patrick) to continue this work. Various portions of the liturgy are attributed to him, but without much certainty. Celestine died on April 6, 432, and was buried in the cemetery of Saint Priscilla, but his body now is said to lie in the Basilica di Santa Prassede. He is recognized as a saint in both the Catholic and Orthodox traditions. Little is known of Celestine's early history except that he was a Roman whose father's name was Priscus and that he may have been a close relative of the family of Emperor Valentian III. He is said to have lived for a time at Milan with Saint Ambrose. In a document of Pope Innocent I dated 416, Celestine is referred to as "the Deacon." In 418 Saint Augustine wrote to him (Epist., 192) in very reverential language, calling him "My Venerable Lord and Highly Esteemed and Holy Brother." Celestine succeeded Boniface I as pope on September 10, 422 (some reckonings make it November 3). Boniface's own election had been a contested one, which had thrown the city into tumult when the archdeacon Eulalius was ordained prior to Boniface's election and the emperor initially recognized the "anti-pope." It is not known whether Celestine's own position as deacon may have been a factor in his acceptability, but he was elected without any opposition, as even Eulalius and his supporters did not attempt to reassert themselves. Saint Augustine appealed to Celestine for help in dealing with a bishop that Augustine now regretted ordaining. 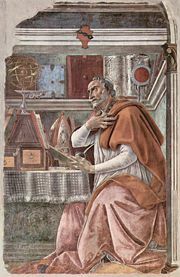 Shortly after his elevation, Augustine again wrote to Celestine, this time asking for his help in dealing with the corrupt Antony of Fessula (Fussula) in Africa, whom Augustine admitted to unwisely recommending to the people of that town to become their bishop. A strong friendship seems to have existed between Celestine and Augustine, who freely confessed his mistake to the pope. "I am so racked with anxiety and grief," Augustine wrote of the matter, "that I think of retiring from the responsibilities of the episcopal office, and abandoning myself to demonstrations of sorrow corresponding to the greatness of my error." After the death of Augustine in 430, Celestine wrote a long letter to the bishops of Gaul on the sanctity, learning, and zeal of the great African bishop who had so forcefully led the intellectual assault against the teachings of Pelagius and his followers. Celestine forbade all attacks upon Augustine's memory on the part of the Semipelagians, who, under the leadership of the famous ascetic John Cassian, were then beginning to gain influence. The theological climate of Celestine's papacy was a stormy one. The Manichæans, Donatists, Noviatianists, and Pelagians were all accused of "troubling the peace of the Church." Meanwhile, "barbarian" invaders, many of whom were Arian Christians, were beginning to make inroads into the heart of the empire. Celestine received important aid in his struggle against the Manichæans from the young Emperor Valentinian III's mother Placidia, who—in the name of her youthful son—banished the Manichæans and other heretics from Rome. Celestine also moved forcefully against the Pelagians, banishing Caelestius, the companion and chief disciple of Pelagius, from Italy. He supported the further condemnation of Pelagianism at the Council of Ephesus. To combat Pelagianism in the land of its origin, Celestine sent missionaries to the British isles and consecrated Palladius to become the first bishop of Ireland in 431. Against the Novatianists, Celestine was no less determined. These puritanical Christians insisted that those who had been baptized by lapsed or heretical clergy must be re-baptized, a policy deemed contrary to the Catholic sacramental theology and therefor heretical. The Novatianist community in Rome was a substantial one, and Celestine confiscated its properties. A firm upholder of the rights of the papacy, Celestine wrote to the bishops of Illyria, in the western part of today's Balkan Peninsula, commanding them return to obedience to the bishop of Thessalonica, the papal vicar. He reminded these churchmen that they must not consecrate any bishop or hold any regional church councils without the approval of the pope's representative. He also wrote to the bishops of Vienne and Narbonne, whom he warned—agreeing with the warning of his predecessor Boniface—to resist the dominance of the see of Arles. Celestine ruled that these bishops must not refuse to give absolution to those who waited until they were near death to confess their sins. He also decided that bishops must not dress as monks. To the bishops of Apulia and Calabria he commanded that laypersons must not be elected to the episcopate over the heads of the clergy and that the popular will—no matter how strong—is not to take precedence over the wisdom of the clergy. In upholding the right of the Roman Church to decide appeals from all quarters, however, Celestine came into conflict with the churches of Africa. The African bishops expressed considerable anger at some of the decisions made by Celestine and previous popes—particularly in the matter of the deposed bishop Apiarius of Sicca—but stopped short of questioning the primacy of Rome, on whose authority they had relied during previous controversies. The last years of Celestine's pontificate were taken up with the struggle in the east over the teachings of Nestorius. Nestorius had been appointed as patriarch of Constantinople in 428 with Celestine's approval, and he wrote at least three letters addressed to Celestine. Nestorius aroused suspicions by receiving with hospitality certain Pelagians who had been banished from Rome. In one letter to Celestine, Nestorius requested information from the pope about these men and expressed concern that Celestine had not yet written back to him about them. Shortly after this, rumors began to circulate that his teachings concerning the twofold personality of Christ (divine and human) were not orthodox. Celestine asked Patriarch Cyril of Alexandria to investigate and make a report. Cyril considered Nestorius' characterization of the Virgin Mary as "Christokos" (bearer of Christ) inadequate, insisting that he affirm her as "Theotokos" (bearer of God), which to Nestorius smacked of Monophysitism. At a Roman synod in 430, Celestine became convinced of Nestorius' status as a heretic and ordered Cyril, in his name as pope, to proceed against Nestorius. The patriarch of Constantinople would be excommunicated and deposed unless he would solemnly retract his "errors" in writing within ten days. At the same time Celestine restored all who had been excommunicated or deprived by Nestorius. Cyril, not wanting to appear subservient to Rome, sent his own anathema to Nestorius along with the Roman patriarch's sentence. The eastern emperor, Theodosius II, now summoned an ecumenical council to meet at Ephesus in 431. To this council Celestine sent three legates, whom he instructed to be guided by Cyril. Celestine makes it clear in his letters, however, that he considered his own decision as final. 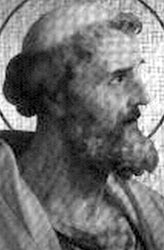 When the papal delegates arrived on July 10, Nestorius had already been excommunicated, leaving the pope's men little role but to ratify the council's decision. Late in his life, some believe that Celestine sent Saint Patrick to Ireland, although the story may be apocryphal. He had already sent Palladius as bishop to the "Scots [i.e. Irish] believing in Christ." According to the Catholic Encyclopedia, Patrick, who had previously been refused in his request, received the long-coveted commission only a few days before the death of Celestine. Other authorities insist that this is merely a legend. The precise date of Celestine's death is uncertain. His feast is kept in the Latin Church on April 6, 432, the day on which his body was placed in the Catacombs of Saint Priscilla. In the Greek Orthodox Church, where he is highly honored for his condemnation of Nestorius, his feast falls on April 8. Celestine I played a substantial role in the Catholic Church's repression of heresy and its struggle to assert the primacy of the See of Peter. He finalized the Church's opposition to Pelagianism and banished its leaders from Rome, as well as the leaders of several other movements deemed heretical. In sending missionaries to the British Isles to combat the Pelagians, he helped establish Rome's influence in Ireland, even if he never sent Saint Patrick there. Celestine's opposition to Nestorius set the papacy's course on that question, which continued to be a major one until the Council of Chalcedon and beyond. The extant writings of Saint Celestine consist of 16 letters and a fragment of a discourse on Nestorianism delivered in the Roman synod of 430. The letters to him by Nestorius provide important information on that controversy, and those written to him by Augustine give fascinating insights into the character of the great bishop of Hippo. A collection of ten decisions on the subject of grace, which played a major part in the history of Augustinianism, known as the "Capitula Coelestini," are no longer attributed to Celestine's authorship. As a builder, Celestine restored and embellished the church of Santa Maria in Trastevere, which had suffered from the pillage of Rome by the Goths in 411. He also contributed to the restoration of the church of Saint Sabina and the decoration of the Cemetery of Saint Priscilla, where he would later be buried. His body was transferred in 820 by Pope Paschal I to the church of Santa Prassede, although the Cathedral of Mantua also claims his relics. He is honored as a saint in both the Orthodox and Catholic church traditions. This page was last modified on 24 May 2008, at 23:22.